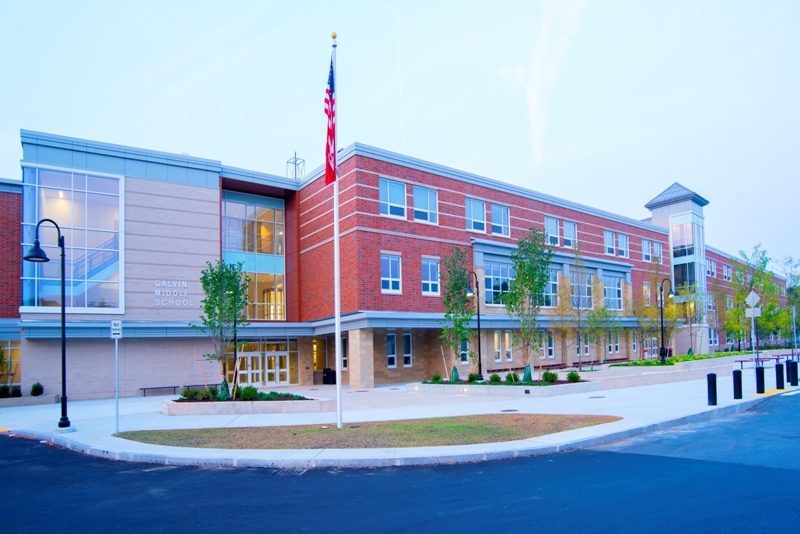 (Boston, MA) – BOND, the Northeast’s premier full-service construction management and general contracting company, recently celebrated the final completion of the new 188,000 square-foot Galvin Middle School in Wakefield, Mass., just in time for the 2015 academic year. The new school provides the space and technology necessary for a modern curriculum, including updated classroom and laboratory space, a music wing, dining facility and gymnasium. A new auditorium features a stage and seating to accommodate student assemblies and performances, as well as town meetings and activities. An outdoor physical education classroom, two basketball courts and two turf fields enhance the school’s athletic program. BOND worked collaboratively for the past two years with the Town of Wakefield School Committee, the Town of Wakefield Permanent Building Committee, Joslin Lesser & Associates, and architect Tappe Associates to successfully deliver the complex. As the new, three-story facility was built adjacent to Wakefield’s existing 60-year-old middle school, close coordination between all team members was required to develop strict mitigation protocols emphasizing student, parent, and faculty safety, and minimizing disruption to occupied learning environments. A detailed, phased construction approach enabled Wakefield students to continue their education while portions of the new facility were built.